12th January, 2000 -10 pm. 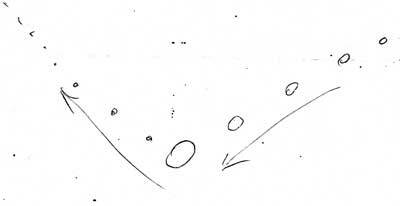 Two observers were watching for satellites when they saw a round, white light which started small, like a satellite then increased in size to Moon size. It came closer then got larger and brighter. Then it turned right and got smaller like a satellite in orbit. It was in sight for about 20 seconds. 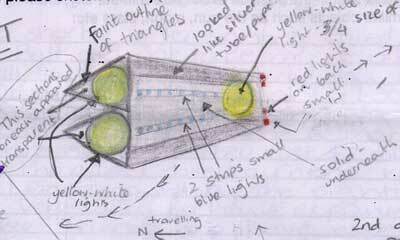 Witness reported a large triangular shaped object with 3 yellow lights and smaller blue lights. There appeared to be a metal strip along the side of the object. It was flying from SE in a northerly direction. Object passed by witness at a fast speed and disappeared to the NW. Two witnesses (Husband & Wife) heard dogs barking and went out where they observed a large dark object with lights around the edge. No noise was heard. It was flying North to South direction. Thanks to Keith Douglas of Alice Springs for this report. Two witnesses (Husband & Wife), aroused by dogs barking "madly". They observed a disc shaped object with orange around the edge. It looked as if "the trees were on fire" at first. After hovering, it moved out of sight. Viewing time was about 10 minutes.